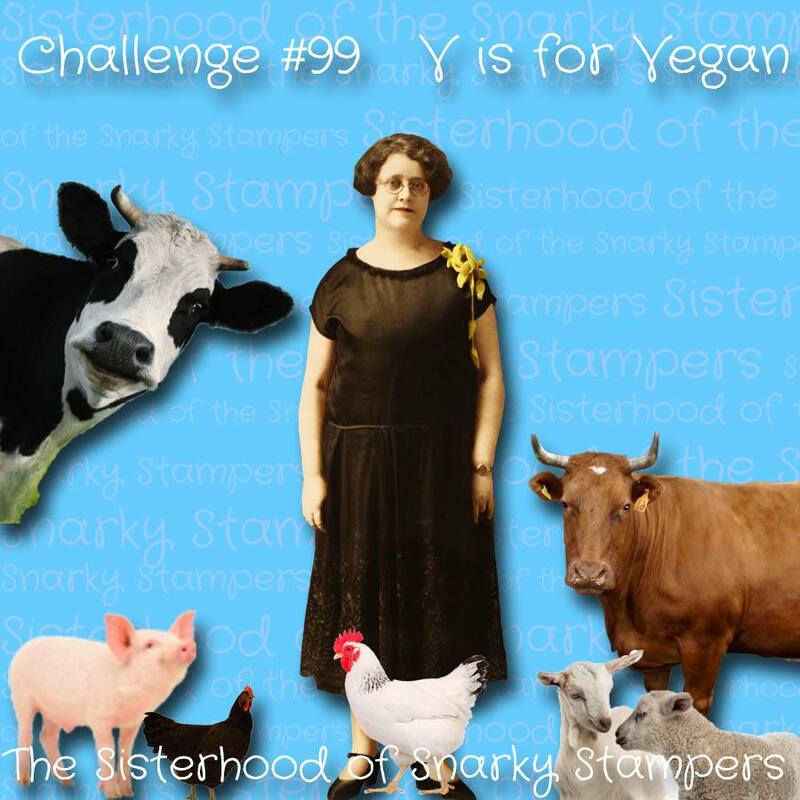 It's new challenge time at the Sisterhood of Snarky Stampers and this time Edna has chosen V is for Vegan which simply means we want to see an animal on your card rather than on your plate! I've never knowingly eaten elephant, and don't plan to, nevertheless I decided to feature an elephant on my card. Because lurking in my Very Old Stamps I have an unmounted stamp of an elephant's bottom, and I get far too little reason to stamp elephant's bottoms. It's an unmounted stamp and I'm guessing from the colour of the rubber that it came in a grab bag from Viva Las Vegas. I started by sizing and printing the sentiment and pile of poo - these were a free download which I think came from Bugaboo stamps - and then cut the paper to shape. I stamped the elephant in dark grey then coloured it in with various grey pencils, then used a deckle edged ruler to draw a skyline and stamped the lone tree (a Debbi Moore stamp which I lost about 10 minutes after making this card, I hope it turns up again soon!). I added just a hint of distant savannah and sky with watercolours and used a pencil to doodle in the footprints. I coloured the egret on the elephant's back with a white gel pen to make it stand out, and finished the pile of poo with glossy accents. Fantastic card, love it. I have that freebie from Bugaboo as well, just saw it yesterday. Great depth on the elephant and horizon. A super card Jane, a great design. I love that you made glossy poo! Ohhhhhhhh glossy poo!!! Very fitting for an elephant's bottom!